119. here for dinner. Rob and I took a horse back ride in the afternoon and enjoyed it immensely I helped do the evening work, read a little and went to bed early. Hattie went over to Winnies to stay all night. I wrote to Charlie today. Monday October 25th 1875. We washed an immense washing today But hung out only a part of the clothes. It was a gloomy stormy night. 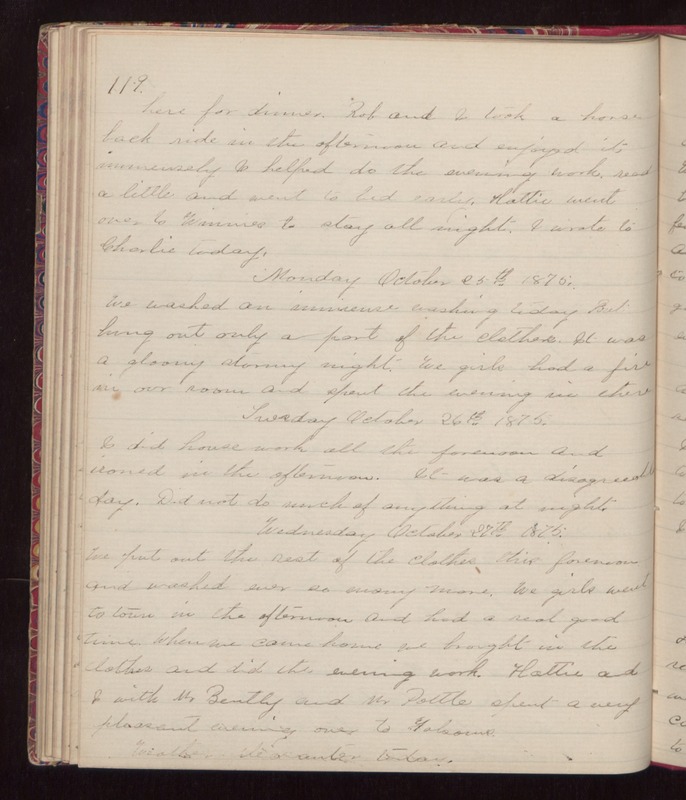 we girls had a fire in our room and spent the evening in there Tuesday October 26th 1875. I did house work all the forenoon and ironed in the afternoon. It was a disagreeable day. Did not do much of anything at night. Wednesday October 27th 1875. We put out the rest of the clothes this forenoon and washed ever so many more. We girls went to town in the afternoon and had a real good time. When we came home we brought in the clothes and did the evening work. Hattie and I with Mr Bently and Mr Pottle spent a very pleasant evening over to Folsoms. Weather pleasanter today.